Try our two best-selling plant feeds and experience the ultimate in feed and fertiliser for your potted, basket and container plants! This brand new and exclusive product represents the very best of commercial plant food and water retention technology and is based on over 25 years of Peter’s hands on experience of growing plants within the horticultural sector. 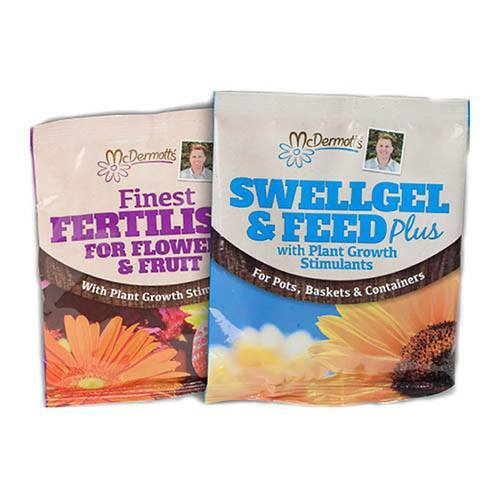 McDermotts SwellGel & Feed PLUS is the complete food and drink for your plants and hanging baskets, and has been specially formulated to work even better than its next best competitor! A true garden essential, it contains an especially formulated high water absorption crystal, which locks in water and swells up to a gel in your hanging baskets, tubs and pots. Containing all of the important nutrients that are essential to look after shoots, roots and flowering and fruit yield for bigger crops and floral displays. McDermott's Finest Fertiliser is the only plant food you will need this year for all your crops, and is the equivalent of your total multi-vitamin plus a healthy diet for your plants, all wrapped up in a single product! It contains all of the important plant nutrients that are essential for that perfect look and professional results.